D’Arcy directing the production of one of her ambitious and elaborate model rooms. Traditional sofas paired with steel-frame chairs. Wicker baskets atop Lucite sidetables. African sculptures alongside French antiques. If you’ve ever been wowed by a home’s bewitching mix of unlikely elements, you likely have Barbara D’Arcy to thank for it. And yet, odds are you’ve never heard of her. her radical ideas about what should be sold, and how, revolutionized the retail home-goods landscape and influenced a generation of designers and tastemakers. Back before our current century, before the early 2000s reign of Domino and Lucky and the rise of mass retailers such as Restoration Hardware, there was Bloomingdale’s. From the late 1950s through the ’70s, the once-stodgy store on Manhattan’s Upper East Side was transformed into a trendsetting global destination (the Queen of England paid a visit). French country details and textured plaster meet Hindu statues and polished chrome. The floors are in cocoa matting, “the material used on diving boards,” D’Arcy said. D’Arcy was central to this metamorphosis. “If Barbara D’Arcy isn’t a household name, she certainly should be,” wrote the legendary retailer Marvin Traub in his 1993 memoir. But as he knew, D’Arcy’s force was like a weather front: Indomitable, pervasive, yet invisible. In time, everyone knew what they liked, they just didn’t know who’d made them like it. D’Arcy was born in New York City in 1928 to an art-teacher mother and a father who managed a moving and storage company that gave him a keen eye for furniture. They took their daughter for long walks through the city, looking at antiques shops and instilling in her a unique sense of style—“not school-taught, but city-bred,” as Traub put it. In 1952, after graduating from the College of New Rochelle with a degree in art, D’Arcy started work as a junior decorator in the fabrics department at Bloomingdale’s, a few blocks from where she’d grown up. In short order, she invented a whole new method of retail display: Rather than lining up furniture in a row, as had long been the norm, she designed entire vignettes that included everything from sofa to ottoman to rug, embarking on flights of fancy never before seen in a store and pulling in a dazzling array of references. walls and floors and across the inflatable plastic furniture. D’Arcy’s rooms were the original pop-up stores, open to anyone and everyone who wandered by, and people flocked to them. What she sold transcended furniture—those visitors who didn’t part with a penny still walked away with new ideas about color, pattern and taste. Take, for instance, her famous 1972 Cave Room. 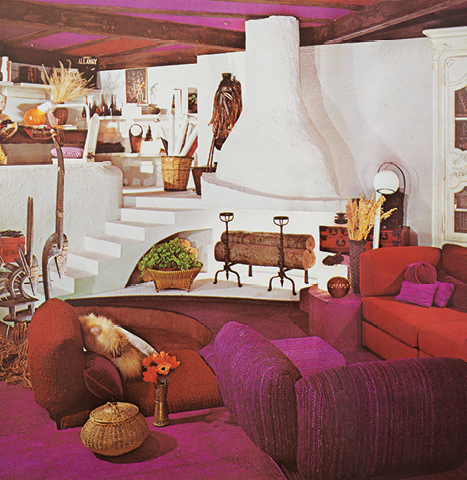 Inspired by the French architect Jacques Couëlle, D’Arcy dreamed up an open-plan, white-stucco fantasia, using chicken wire and spray-on polyurethane to sculpt a living-dining-bedroom space with a series of steps, a fireplace and a conversation pit filled with purple cushions (one of her favorite colors). and luxe fur is a masterful marriage of richness and restraint. Indeed, Paula Deitz, editor of The Hudson Review, remembers walking into one of D’Arcy’s rooms in 1975 and knowing immediately that she had to have it. “I wanted my summer house to look exactly like that,” she recalls. For decades after, until it was irrevocably faded by the sun, the living room furniture at her home in Maine was covered in the same green batik that D’Arcy had originally deployed. D’Arcy’s model rooms exuded soulfulness, even when provocative. by strong, saturated hues that extend even to the upholstered ceiling. room incorporated a period mantel design with shuttered doors. effect, stacked into architectural columns and used as desk legs and side tables. In 1973, just two years before she was named a vice president of Bloomingdale’s, D’Arcy published her first and only volume, Bloomingdale’s Book of Home Decorating, a photo-illustrated collection of her famous rooms. For the first time, she set her decorating principles in print. Written by Kate Bolick. Photo Research by Georgia Parker.